The DON ANTONIO DE ULLOA was part of Admiral Montojo's squadron at the Battle of Manila Bay/Cavite. She was damaged by the fire from the American squadron under Commodore George Dewey, and sunk. The vessel was named for Almirante (Admiral) Don Antonio de Ulloa (1716-1795), who was a well-known and great Spanish navigator and astronomer. His works were known all through Europe. He led one expedition which explored portions of South America. Beginning in 1764, he served as the Governor of Louisiana. 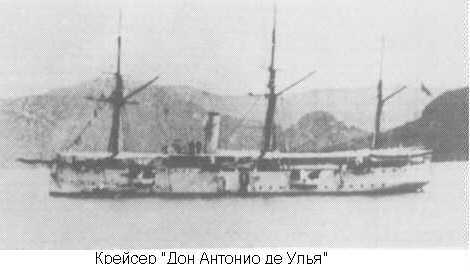 The DON ANTONIO DE ULLOA, built at Caracca for the Spanish navy, was completed in 1889. She was ship of VELASCO-class, and had seven sisterships (this was a large series of Spanish cruisers). ULLOA was sent to the Philippines for to replace her sistership, GRAVINA, Which was lost in a typhoon on July 10, 1884. Because of the Caroline Islands crisis in 1890, she was sent to the Carolines. Beginning in 1890, she based in the Philippines. When Philippine Insurrection began, DON ANTONIO DE ULLOA took part in actions against the Insurgents. In 1897 she transported landing parties to Zampoanga, for action against the Insurgents in battles near Matabarra (Incha isla). By 1898, her machinery was in poor condition and in great need of repair. In spring of 1898 her machinery was removed to be overhauled. Her port battery was removed and set up on shore as part of the defenses. Her crew was at about half-strength as she only had enough crewmen to man the starboard battery. During the first phase of battle she was hit a few times. However, one large shell burst on her upper deck and her commanding officer and most of her crew were killed or wounded. When Admiral Montojo gave the order for the vessels to retire behind Sangley Point, the cruiser had virtually no crew, and could not respond to the order. During the battle she was moored head and stern, behind Sangley Point. The low, sandy point was expected to provide some protection for her hull. There is some information to indicate that she settled into the bottom at this point. If this information is correct, then during second phase of battle, she had no crew. During the second phase of the battle, she still had a large flag on her mast, and the Americans mistakenly thought that the cruiser was still ready for combat. Whether the DON ANTONIO DE ULLOA had a crew or not, during second phase of battle she was riddled with shells. Lt. Ellicott reported finding 33 shell hits on ULLOA's hull (four 203mm, three 152mm, one 127mm with the remaining being 47mm and 37mm). In addition to her commanding officer, there were 8 men killed and 10 wounded. After the battle, a landing party from the PETREL set her on fire. The damage to the vessel was so great that the American found reconstruction of the vessel to be impractical, and the hulk was scrapped. The Cruiser DON ANTONIO DE ULLOA was in poor constion at the time of the battle. Major portions of her armament had been removed, and her machinery was in poor shape. Ellicott J. "The Effect of Gunfire, Battle of Manila Bay," Proceedings of the United States Naval Institute. (Annapolis: U.S. Naval Institute, 1899).